Welcome to Chester Great Outdoors Club! 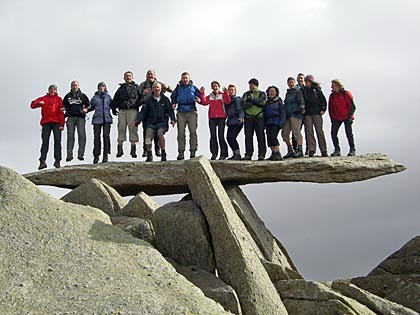 We are a friendly group of like-minded people based in and around Chester who share a passion for outdoor activities. We arrange a variety of events throughout the year. Our main activities are walking, biking (both mountain and road) and climbing, but events range from scrambling and caving, through to canoeing, surfing, sailing, and skiing. In short, we do whatever our members want to arrange! All this activity can make us thirsty and hungry so we try to slip in the odd trip to the pub, tea shop or restaurant, just to keep energy levels up. The Club is run by its members for its members, so we encourage everyone to arrange club events, sharing the fun, responsibility, hassle and glory between us. All members are encouraged to develop their skills and experience, and anybody with a good idea is welcome to run an event, provided we can do it safely and without going bankrupt! There's a prize for the best event at our AGM. We run weekend, day and evening events throughout the year. There's something on every week and often several times a week during summer. We plan to have a weekend away every month, and several day walks, biking and climbing events every month. During the summer we also have evening walks, biking and outdoor climbing events every week (weather permitting!). Our weekends away take us to North Wales, the Lake District, the Peak District, the Yorkshire Dales, the Welsh Marches, the Brecon Beacons, and even southern Scotland for long weekends. We're lucky to have easy access to some of the best parts of the country! With most of us living around Chester, our day events tend to focus on North Wales, the Peak District, Shropshire or Cheshire. Over the years, club members have also arranged holidays to Scotland and to the Alps for walking, skiing and mountain biking. Well, our current membership is around 100 people, ranging in age between early 20's and late 50's. Our members aren't just from Chester - we have members from Cheshire, Flintshire, Denbighshire, Wrexham, the Wirral, Liverpool, Manchester and Lancashire, as well as a few further afield.